Recently there has been some discussion on-line in other fora soliciting suggestions for "portable" antennas. Admittedly my idea of portable is thrown wire that travels in a ziploc bag. But, in the vein of never-say-never, there could be a time one isn't afoot all the time, or has some hirelings, and could tote something larger to their favorite spot . But the spot has no vertical structure of any kind, although there is the means to guy-off something if needed. Does anyone here have experience with any of the popular push-up verticals or dipoles that could be toted in a bag under the arm and set up, say, on a beach somewhere? The Buddipole is one common one I hear about; the Superpole is another. Buddipole (and Buddistick) have long-standing reputations; the other uses no coil clips but rather slides to adjust roughly for the band. Just wondering if anyone has ever been in that situation, what was used, and what were the results. Just to keep the size parameters reasonable, we're talking 20-17-15m, that kind of thing, 30m would be dessert. Antenna tuner is available. I've had good luck with my Buddistick... Even made contact with Ray 830 miles away once on 30m with the stick inside the house and 2W power! I have a buddipole and it works great. The standard kit with 2 additional counterpoises makes a great NVIS antenna. Resurrecting an old thread again, that's me. I have a Superantenna MP-1, and it works great on 40-10. Haven't tried it on 6, but it shows acceptable SWR. I've had this antenna for a few months but have only really started using it a lot in the last few weeks. So far, so good. I'm enamored with 1/2 wave end feds and have had great results. I love an antenna that fits in a ziploc, but they need trees. What I really want to get into next is mag loop antennas. Though a bit pricey, the AlexLoop Walkham covers 40M-10M at 10W CW and gets great reviews (5.0/5.0 from 36 reviews!). You don't need to spend that much Bob. You can get a high voltage air capacitor for about $70, and a thick 10ft coax patch cable to use for the loop. Use a toroid core for feeding, and you'll get your Alex loop for about $100. That's what I'm going to do.. 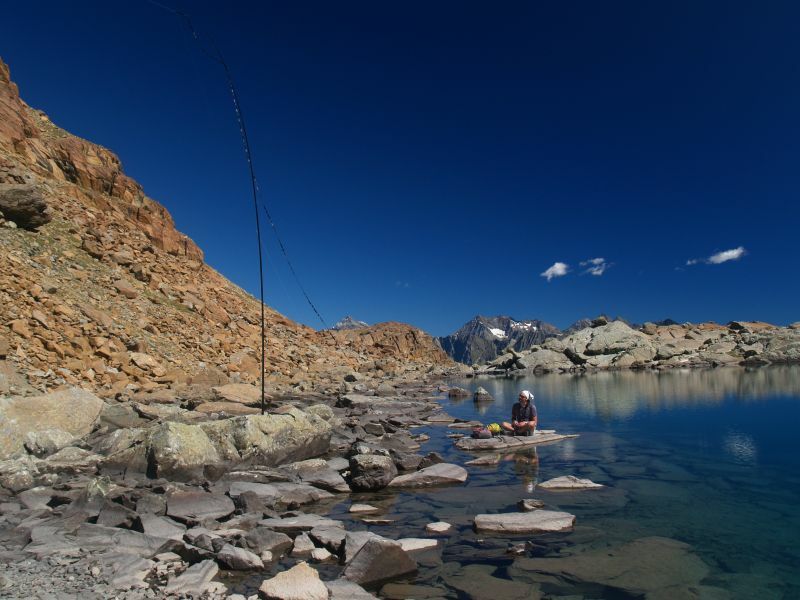 I casually stumbled to this forum browsing the internet and I found it interesting because it deals with radio-hiking, which is an activity I like a lot. My name is Davide, I'm from Italy and my callsign is IZ2UUF. I live in Milan but I have a little house in the middle of the Alps, near the border of Switzerland, where I spend a lot of time. I work mostly HF in CW only. 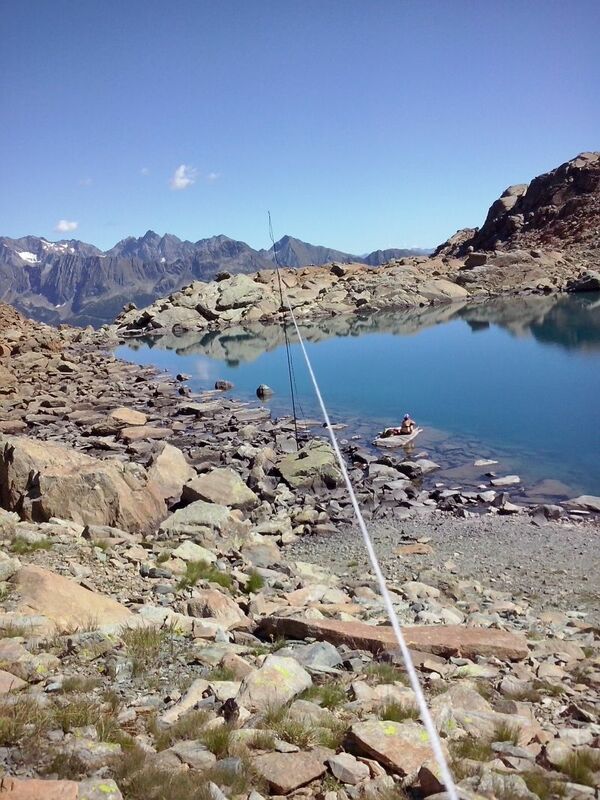 When the trip altitude gap is below 1200m (4000 ft), I can afford to carry my FT-817, a little tuner and a 10m fishing pole in my backpack. Initially I was using a vertical antenna but, after some reasoning and simulations, I decided to switch on a dipole. In order to keep the dipole high on the 10m fishing pole and almost horizontal, I feed the dipole with a 450-ohm window line directly to the tuner (without balun). Then a very short run of RG-58 connects the tuner to the radio. In this way, being this dipole very light, I can keep it at almost 10m from ground without overloading the fishing pole. The dipole can be of any lenght and it works on all bands. With a 16m long dipole (8m/26ft each side) I have optimal results in all bands from 15m to 40m, while it still works reasonably well in 12 and 10m. The dipole has two 20m thin strings on each side: in this way, pulling the strings far away, I can obtain a very open inverted-vee shape (140°). Below the diagrams of this antenna (blue) compared with a 10m vertical pole (red) in same portable condition explain numerically why this antenna works so well. Tis is in 10m, where lobes are not so good. To work 10m a shorter dipole would be better. I would like to recommend this solution because results, as predicted by computer simulation, has been astonishing. This antenna requires a lot of estate to pull the strings, but space it is one of the few resources available with abundance in this kind of activity. Although the dipole performances are well known, this kind of solution is seldom considered for QRP/P activity, mostly for the weight of the balun and coax that can't be suspended at the top on a thin fishing pole. This solution solves both the weight and the multi-band issues. I hope this solution has been of your interest. Davide, welcome to the forum, glad to have you aboard. Awesome photos, thanks for sharing. Beautiful Photographs, David! Thank you for posting. You are very welcome aboard here. I can indeed have a schedule for a CW QSO: better when I am at my QTH because in my QRP/P activity it don't know whether and when I can be on air. I usually walk maybe 3/4 hours and when I find a nice spot I might have just 30' on-air. Open-wire (aka window/ladder lines) are an ancient type of transmission line, unfortunately unknown to many OM. Their strong point is the ability to deal with greatly mismatched antennae with a negligible loss, while coax, due to its low characteristic impedance, pays great losses. This allows using random-length dipoles, like in my case, with an overall loss due to line and tuner around 0.3 dB. Their weak point is that the RF energy is carried outside the line and not confined within the shield: this means that they interact with every object they encounter and their path must be carefully planned. Nov.2009 QST has a very interesting article on the interaction an open-wire line has with wet/dry soil when laid on ground.